Ghana’s official national language is English. But for most citizens English is also a second language. Until recently, children in the country had to learn English as soon as they entered school. But, many had little contact with English, especially those in poor rural areas. As a result, many Ghanaian children never learned to read and write. The National Literacy Acceleration Program (NALAP) was designed to help deal with this problem. The country-wide program opened in 2010. It teaches reading and writing in local languages during a two-year kindergarten program and during grades one through three. Then in grade four, children begin to study in English only. 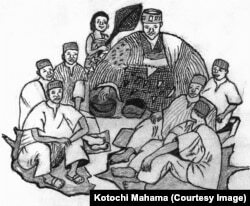 Safaliba is a rare language with about 7,000 speakers in several towns in northern Ghana. It is mainly a spoken language. Among Safaliba speakers, the literacy rate in English is only eight percent. Public school teachers in northern Ghana teach reading and writing in English and Gonja, one of the more common native languages in the area. The Ministry of Education provides the local schools with materials in those languages. Safaliba had no common written form until 2003. A research team of Ghanaian and American educators is working to change that. Paul Schaefer grew up in Ghana and works for the Christian based non-governmental organization GILLBT. That stands for Ghana Institute of Linguistics, Literacy, and Bible Translation. Beginning in 1998, he and his wife, Jennifer Schaefer, studied the Safaliba language. They worked together with Safaliba speakers to develop a way to write the language. They used this written language in adult literacy programs and published short books for the students to read. Iddi Bayaya is the main Safaliba literacy teacher. He is a farmer who had a few years of primary school education. Mr. Bayaya attended government-supported classes in Gonja and learned to be a literacy facilitator in that language. Since 2003, Mr. Bayaya has taught a nightly literacy class in his northern Ghanaian hometown, Mandari. He trained several other people to teach Safaliba literacy in Mandari. Then he began literacy classes in two other Safaliba-speaking villages. Soon children started coming to the adult classes. The young people learned the written language quickly. Paul Schaefer says the classes helped people learn the many ways written language could help them. He says they also learned that children who learn to read and write in their own language can use those skills in a second language and do better in school. “So then they were basically saying that, well, we've seen that this does benefit the children in their formal education, why can't we have our language in the schools?" Paul Schaefer says the idea came from the famous anthropologist Esther Goody. It was not long before the Safaliba community asked to enlarge the adult program to include children. Ari Sherris is a professor of bilingual education at Texas A&M University in Kingsville, Texas. He began working with the government literacy program in Ghana about ten years ago. Esther Goody introduced him to Paul Schaefer in 2012 and over the next two years they talked about ways to work together on the school project. In 2014, Mr. Sherris visited the Safaliba area twice and helped encourage the new movement to teach the Safaliba language in school. He plans to live with Safaliba speakers and help them create Safaliba-English bilingual books. The Mandari Safaliba Chief, Bodua Mango Kafinti the Second, also supports this effort. He sees the writing of Safaliba as a way to preserve the language. He says the language helps protect the culture. He says people must become proud of their language to guarantee it continues. In January, the U.S. Department of State awarded Professor Sherris an education prize called a Fulbright. It will support him to come to Ghana for a year to help develop the bilingual program for school children in Safaliba and English. Ari Sherris and Mr. Schaefer together visited a class in northern Ghana. They noticed that some children struggled with English while others did not. The educators learned that the more successful children attended the night classes with their parents. 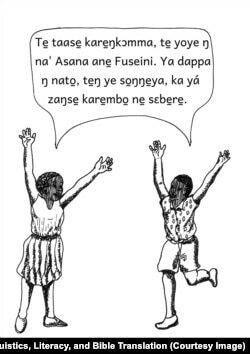 Since the Safaliba language has only recently been written, there are few materials for teachers and students to read. Paul Schaefer is happy that donors to the Safaliba project recently purchased a copy machine, called a duplicator. Having the duplicator in the Safaliba area makes it possible to do almost all the printing work locally. It will help the Safaliba community to print books in their own language. A Safaliba speaking artist, Kotochi Mahatma, will be creating illustrations for the books. The new duplicator meant that GILLBT could publish a dictionary for beginning readers. The first bilingual dictionary of Safaliba and English was published in 2014. It has almost 1000 words. It will help both beginning readers of Safaliba and beginning learners of English. The dictionary also provides teachers with creative, fun, educational activities for young learners. As their Chief hopes, young children in the Safaliba community can now learn to read and take pride in their language. Jill Robbins reported and wrote this story for Learning English. Caty Weaver was the editor. Now it’s your turn. Do children in your area learn in their native language or a second language? What do you think of programs to teach in the native language before teaching in a second language? Write to us in the comments section.